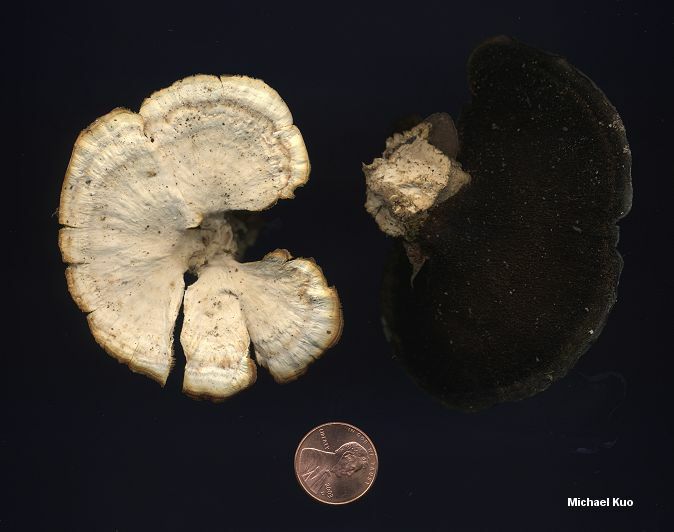 This little toothed mushroom belongs to the Polyporales, but is usually treated in field guides as it is at this site, with other mushrooms that have teeth or spines. Mycorrhaphium adustum can be found in summer and fall on the sticks and small logs of hardwoods in eastern North America, and is easily recognized by the teeth on its underside (which get progressively darker as the mushroom matures), the pale cap with a blackish margin, and the gray to black bruising reactions of the cap and underside. Steccherinum adustum is a former name. 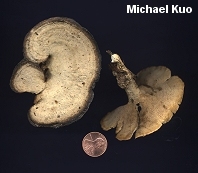 Bjerkandera adusta is not a synonym, but a different mushroom with minute pores rather than teeth. Mycorrhaphium adustulum differs in its smaller cap size (1-2 cm across) and elliptical, rather than cylindrical, spores. Ecology: Saprobic on the dead wood of hardwoods; growing alone or in clusters on sticks or small logs rather than larger logs or stumps; summer and fall; widely distributed east of the Rocky Mountains. Cap: 2-8 cm; flat to shallowly depressed; kidney-shaped or almost circular in outline; dry; smooth, velvety, or roughened; white to tan, bruising grayish; with concentric zones of texture; the margin often black. Undersurface: Spines 1-3 mm long, often in fused groups; white at first, becoming pinkish to purplish, then dark brown and eventually black from the margin inward; bruising black. Stem: Often absent; when present 2-3 x 1-2 cm; central or lateral; whitish; velvety. Flesh: White; tough; unchanging when sliced. Microscopic Features: Spores 2.5-4 x 1-1.5 µ; smooth; cylindrical. REFERENCES: (Schweinitz) Maas Geesteranus, 1971. (Smith, Smith & Weber, 1981; Ryvarden, 1989 [Mem. NY Bot. Gar. 49: 344-347]; Lincoff, 1992; Roody, 2003.) Herb. Kuo 07250403.